Antex Exterminating is your local certified pest control expert and exterminator. We provide FREE, no-obligation ant control estimates to any homeowner in the state of North Carolina. Let us help you to eliminate your ant problem - call or contact us today! Antex Exterminating would like to help you eliminate the ants in your home and help you keep them away - permanently! We will help you protect your home from new infestations by protecting your perimeter and identifying likely points of entrance for new ants, so you can act before the ants arrive. Our pest control estimates are free, and they come with no risk or obligation to you. 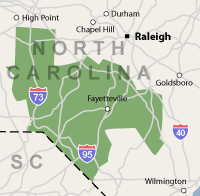 We serve North Carolina, including Sanford, Fayetteville, Asheboro, Rockingham, Fort Bragg, Lumberton, Hope Mills, Clinton, Laurinburg, Raeford, and nearby. For YOUR free, no-obligation ant extermination and control quote, contact Antex Exterminating by phone or e-mail today!